← News – Fugo is free! First announced last year on July, this game have been causing much hype between fans. Even to the point were the newest promos were being showed in the middle of Shinjuku (a not-so-otaku city in Tokyo) and almost everyone stopped to watch! 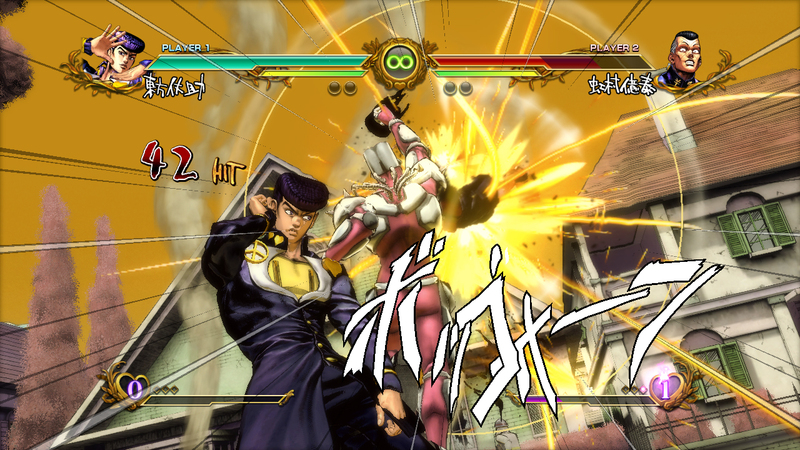 The reason for all this excitement is that this game is a ton of fan-service in a single package, just like the past fighting game adaptation made by Capcom. In fact, there are many elements that hint a cooperation with Cyberconnect2 to a certain point. 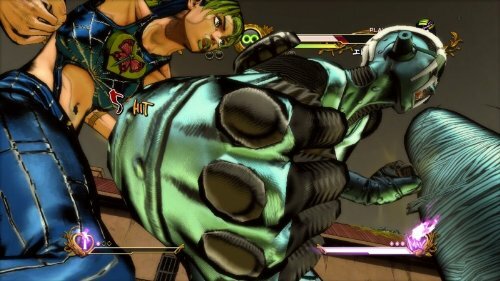 For once, the HD ramastered version of Jojo’s Arcade game was announced very close to this game original announcement. 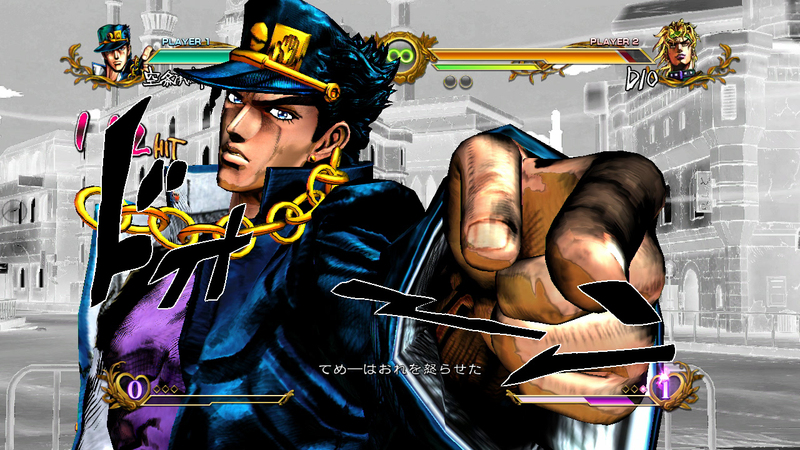 There is also plenty of signs in the game itself, like Jotaro retaining the name “star finger” for one of his moves (originally unnamed in the manga); Some of Joseph’s moves are exactly the same; Stands functionality is very close to Capcom’s idea; And much more…What I believe is that this game is a homage to fans of both the manga series and the old game. The cast is all new, being taken from the newest anime series (that is AWESOME by the way), thus, it is believed that the cast from this title will be the same for future parts in the anime. What is great since they all do an incredible work, making me almost forgetting completely the original cast from Capcom’s game…almost! 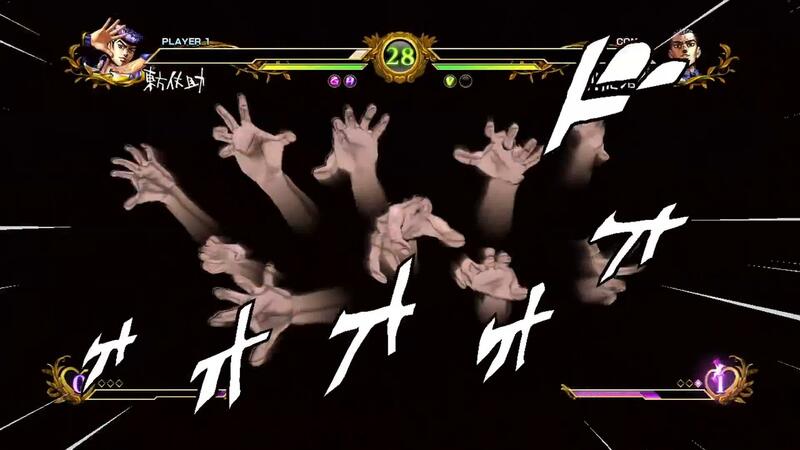 Just like its predecessor, the gameplay is one of the most refined that can be found on a licensed title, especially when it’s about the fighting game genre (those things are much harder to program than it looks). It sure stands out even among other Cyberconnect2 titles, even more than the so praised Naruto games, in my opinion. You can feel that, for this game, they meant to do serious business. 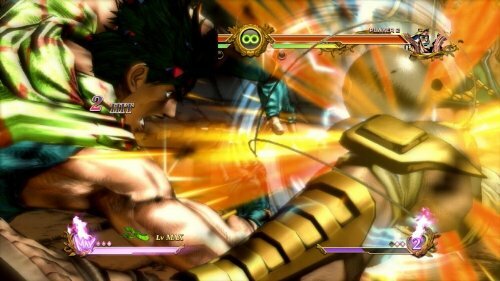 While there is a shortcut key for a simple combo (pressing square repeatedly), all the remaining gameplay is in the good & old fighting game fashion, with one-quarter-forward commands, multiple cancels, moves with gimmicks and specific functions, strategic elements and even some secrets! Some of the elements seems to come from cult games like Darkstalkers (chain combos, super moves) or Garou: Mark of the Wolves (Just Defence), but some are reminiscent of more recent successes like Blazblue (Drives). It all matches perfectly, producing a great experience where you spend hours playing in the practice mode just to learn new combos (I missed this). The presentation is one of the best I’ve ever see! Cyberconnect2 have gone all the way to make even the menus and loading screen very unique. Just like in the Naruto games, characters from the series will talk with you to explain things as you navigate through the options and modes. 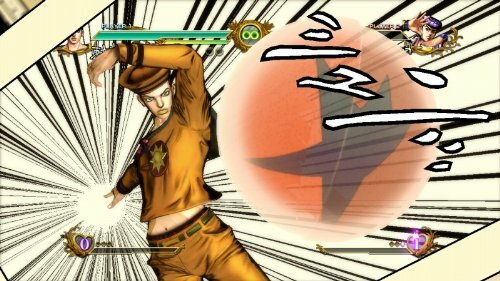 However, while you will be accompanied by Speedwagon in the main menus (one of my favorite characters), many (and I mean MANY) other characters will make an appearance just for one – maybe two – menus of special bonuses. The interesting part is that, they are not as random as they look! 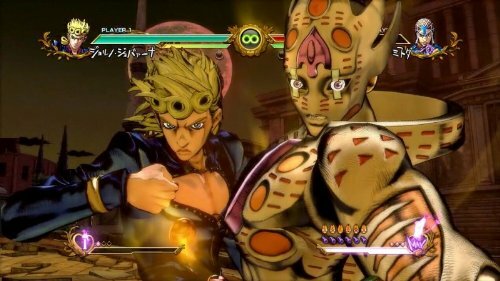 Leone Abbachio will rewind past events with his Moody Blues to replay BGMs; Tonio Trussardi will offer you some food to replenish your energy; Judgment will grant you three wishes, etc…All of this are stuff you know that only people who actually read the manga would know and care. The BGMs are also great! There are just a few that are weak, non-fitting and even anticlimactic (like Funny Valentine’s), but most of the compositions are very flashy and exciting. Just like a Jojo soundtrack has to be! However, the game does, unfortunately, have some weak points. 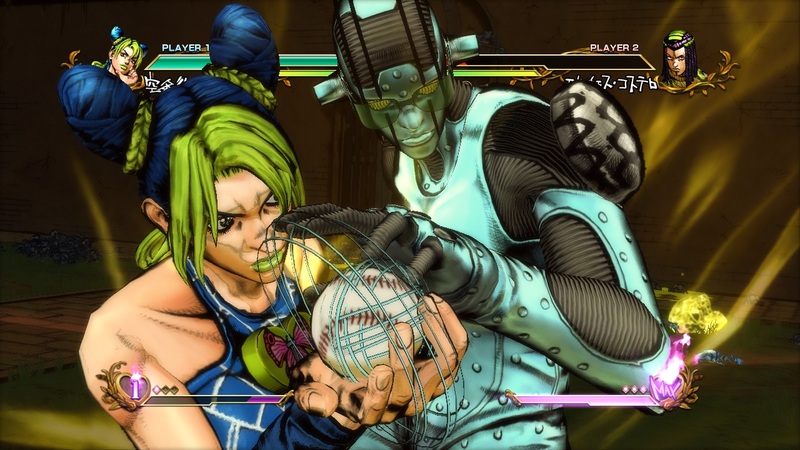 The story mode is very simple and will certainly make Jojo fans that have a passion for the events in the manga wishing for more. But I do understand why Famitsu still gave a full score for this game, since Cyberconnect never promised or even mentioned a story mode in the first place. It is to be a fighting game and it realize this task with high marks. There is a mode to customize every character taunts and victory lines and poses. However, the “Campaign Mode”, where you must play to unlock new stuff, can be incredible dull sometimes and needs an internet connection to be played. Part 2 – Straizo, Santana, Stroheim, Lisa Lisa. Part 3 – Old Joseph, Vanilla Ice, Mariah. 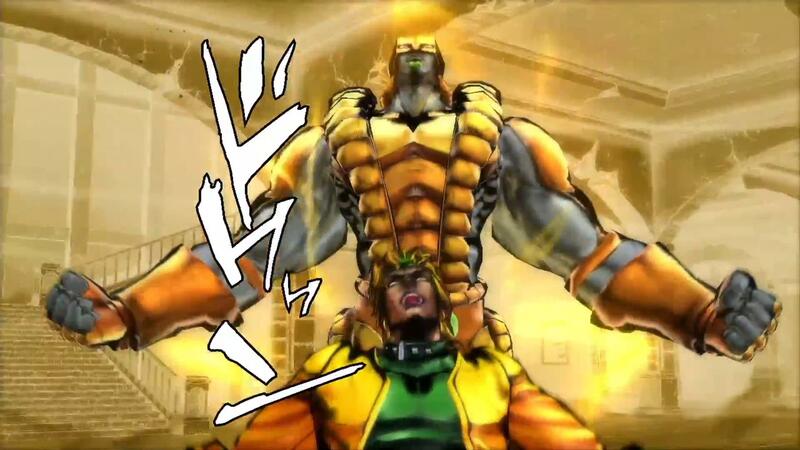 Part 5 – Trish Una, Old/Ghost Polnareff with a Silver Chariot Requiem going wild as his stand. 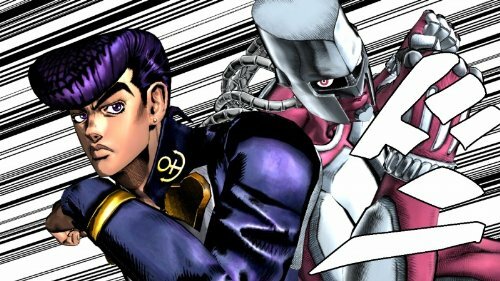 Part 6 – Weather Report, Narciso Anasui, F.F. Part 7 – Mountain Tim, Diego, Wekapipo & Magenta Magenta (the two together as a single character, just like Hol Horse & J. Gail). This entry was posted in Game and tagged CyberConnect2, Fighting Game, Game, PS3, Review. Bookmark the permalink.